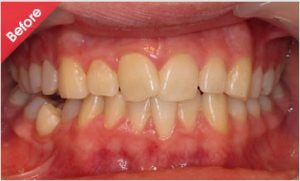 Quick Straight Teeth is a fast, invisible tooth realignment treatment that gives you straight teeth in a short time at a price you can afford. 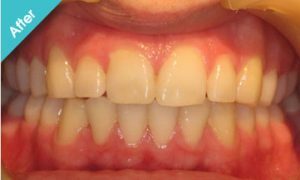 Quick Straight Teeth is the most affordable, comfortable and effective way of straightening your teeth to give you a perfect smile. 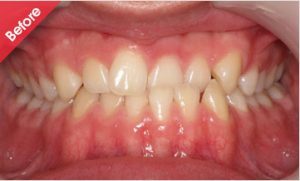 The invisible braces work by only concentrating on the front six to eight teeth. 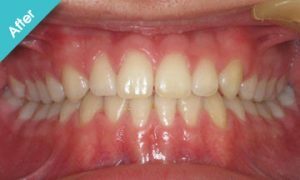 Quick Straight Teeth braces for teeth can correct mild to moderate problems quickly, making it more affordable than similar options and more agreeable to patients to get straighter teeth and affordable braces cost on the Gold coast. 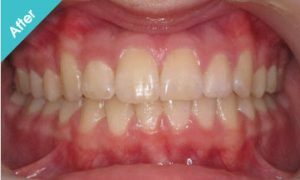 The method overcomes four of the major factors that stop people getting orthodontic treatment to straighten their teeth. Due to low laboratory fees and quick treatment times and prices, Quick Straight Teeth invisible braces are more cost-effective than all other similar adult braces systems on offer in Australia, meaning you can get amazing, clear braces that don’t scrimp on quality for straightening teeth. Both Quick Straight Teeth fixed and removable braces are made of transparent materials and are nearly invisible in the mouth giving you the ability to get affordable straight teeth fast but without ugly, bulky braces. 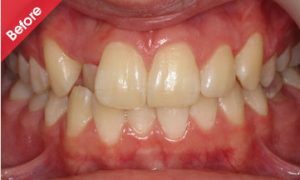 Most people will be unable to tell you are wearing Quick Straight Teeth invisible braces, making it possible to enjoy straighter teeth discreetly. Getting Braces for teeth is fast! 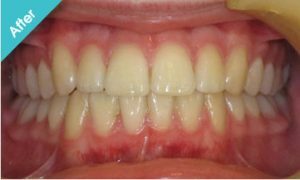 Treatments for teeth straightening takes as little as 4 to 24 weeks depending on complexity. 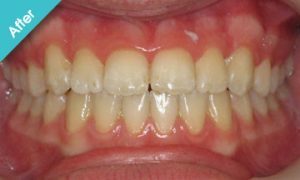 The process means you will be enjoying your straighter teeth before you know it. This system is not only fast, subtle and cost-effective, but has been developed to be as comfortable as possible. Patients who have tried using conventional braces report that Quick Straight Teeth are far more comfortable to wear and with our removable braces you can even take them out while eating and drinking. 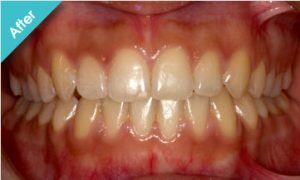 Quick Straight Teeth fixed braces use clear brackets that are virtually invisible, combined with tooth-coloured wires. The use of fixed brackets helps to ensure tooth movement is highly predictable and quick. Unlike conventional orthodontics, there is no need for the wires to be extensively tightened. Instead, the braces apply gentle pressure to the teeth creating minimal discomfort, as only the front six to eight teeth are moved. Quick Straight Teeth removable braces use a series of clear aligners that are nearly invisible. 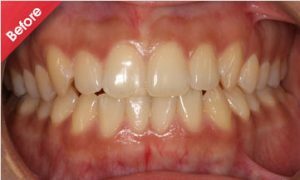 Most orthodontic systems have only one standard aligner, but the Quick Straight Teeth system is a little different. There are five different unique clear aligners that may be used, ensuring you get the best results in the fastest time possible. The braces can be removed for eating and drinking, and while brushing and flossing so there is minimal disruption to everyday life. It is important to wear your removable brace for at least 20 hours each day. What’s more, with our relaxed and comfortable Broadbeach clinic and our super-friendly team on the Gold Coast, you’ll enjoy every visit – think aromatherapy in the treatment rooms and a special refreshment area to freshen up after your visit with a facial spritz, hand cream and bottled water. To book a Quick Straight Teeth consultation with a family dentist on Gold Coast or to find out more about our tooth realignment services, call us today on 07 5531 7259. This lady was particularly unhappy with the upper tooth that was stuck on the inside and the general crowding of her front teeth. She had a QST fixed brace for 6 months and she loves the result! This individual disliked two teeth that were biting the wrong way around. 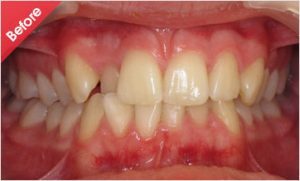 She wore a QST fixed price to correct her bite over a period of four months. During this time the lower teeth were also straightened. This young man was unhappy with the way the front teeth were overlapping and crossed over. QST fixed braces were worn for seven months to align the teeth. He Is now proud of his smile and wishes he had done it sooner! 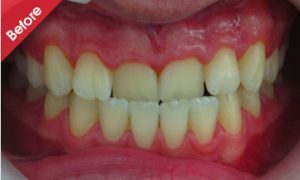 This lady was unhappy with an instanding incisor, that gave the impression she had a missing tooth. As a result she was very embarrassed to smile. She wore a QST fixed price for five months. She now loves to smile and show off her straight teeth! The parents of this young boy were concerned about how the upper front teeth were biting the wrong way around. He did not want to wear a fixed brace. Therefore, a removable QST brace was worn for three months to correct this problem. Need more information? Click here QST Australia.